Video series Ghareeb E Toos is based on the life of the eighth Imam of Shias, Imam Reza (A.S.) and passes through the most prominent parts of Imam's a.s. blessed life. The Series starts with the death of Abbasid ruler Harun. His elder son Maamoun, the then ruler of Marv gets deeply frustrated by the fact that according to Harun`s will his younger brother Amin, who is a carefree and voluptuous young man is appointed the Caliph of Muslims. Maamoun rises up against his step-brother and defeats him. But, agitated by Alavi`s uprising and to calm them down, Maamoun introduces the eighth Imam of the Shiite as his crown prince. Maamoun offers the Imam to become the Caliph of all Muslims but Imam rejects it. He asks Imam to accept the post of crown prince at least. 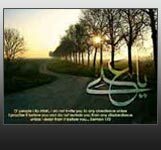 Imam eventually gives up to the demand on condition that he (Imam a.s.) would not have any role in affairs of governance. As Imam's popularity is increasing day by day, Maamoun considers him a menace to his rule and finally martyrs him by feeding him a poisonous elixir that the Imam drinks while he is fully aware of everything.